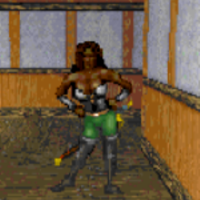 The Fighters Guild is one of the joinable factions in Daggerfall. They are a sophisticated mercenary service, often hired out as guards, escorts, and, occasionally, on more covert missions. The Guild is where everyone with any gold goes to for hired muscle. In the Iliac Bay, the Fighters Guild is often essential for getting things done, leading to a range of possible assignments for guild members. Some quests involve killing creatures that have made their way into houses, killing giants or harpies, and protecting people. This is also the only guild that has a non-random quest, one of the "Lord K'avar" quest series, infamous for spawning seemingly unending waves of assassins. The Fighters Guild operates out of guildhalls in towns across the Iliac Bay region. Guildhalls everywhere share the same basic construction, appearing as very tall, square buildings. All will be open during the same operating hours. 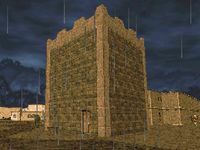 Note: in certain regions of Hammerfell, the Fighters Guild often exists as a holy order. Such guildhalls are holy places which also count as Temples, and apppear on the map as Fighter Trainers. These guildhalls are always open (like Temples), and its smiths can repair multiple items at once. Aside from these minor differences, they are otherwise identical to the Fighters Guild guildhalls found in the remaining regions of the Iliac Bay. 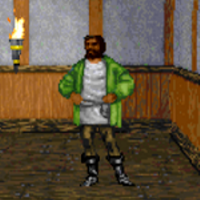 Note: depending on the outcome of a quest, you gain or lose reputation directly with the Guild and the Fighter Questers. Both can therefore be considered as the "Main Faction" and the other two factions aligned with the Guild are considered as subgroups. 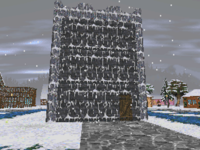 Fighter Questers are the individuals at Fighters Guild guildhalls who offer quests and dispense the associated rewards. Each Fighter Quester potentially offers a wide array of quests for guild members, and a limited number for non-members. The Fighter Equippers will repair and mend unenchanted arms and armor for any member of the Fighters Guild. The costs for a repair depend primarily on your rank within the guild, though your reputation with the faction will also affect the price of their services. Repair times when utilizing these services can take one or more days, depending on how worn the item is and how many items the Equipper is already repairing. At regular Fighters Guild guildhalls, they can only repair one item at a time. This is a serious drawback compared to Armorers, General Stores, or Weapon Smiths. They also hand repaired equipment over only during the regular opening hours (11:00-23:00), regardless of your rank within the guild. 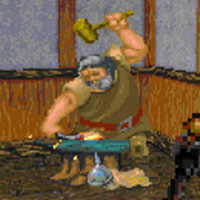 However, the Fighter Equippers at Fighter Trainers guildhalls can repair as many items at a time as Armorers, General Stores, or Weapon Smiths. Since these guildhalls never close, pickup times are similarly not an issue. Fighter Trainers are found in every Fighters Guild guildhall. They are the guildmembers who offer training services in any skill associated with the Guild. The cost of this service is dependent on your character level, 100 gold per level to be precise. As with all skill training, Fighter Trainers can only train a skill up to a maximum of 50%. Because the cost of a training session depends entirely on your character level, your reputation with the Fighter Trainers will not affect the price of their services. (Player's first name), I have an important mission that will require the utmost discretion... You are tasked to protect a spy for Sentinel. Free Lord K'avar from the dungeons of Castle Sentinel before his execution is scheduled. Capture or execute Lord K'avar on Queen Akorithi's behalf in his hideout within Castle Wayrest. Note: it is your guild rank that determines which quests may be offered at any given time, rather than your reputation with the Guild. For example, a character of rank 4 can potentially be offered any quest which requires a reputation of 40 or less. This page was last modified on 18 August 2018, at 13:47.